A bird bath placed in your backyard provides an enjoyable activity for you as well as a gathering place for birds to drink and bathe. 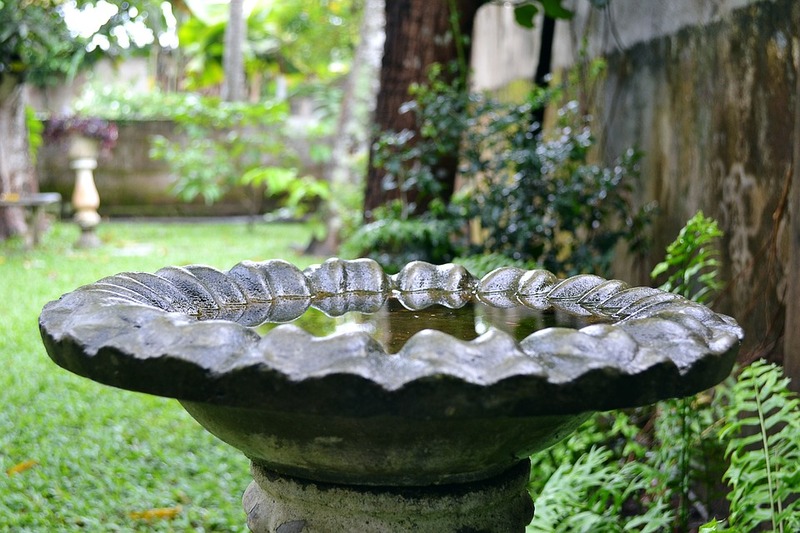 I am going to share several considerations for you to make before buying a bird bath. I will discuss where to place to your bird bath, different types and styles of bird baths, how high to fill a bird bath, maintenance tips, and how to attract birds. The placement of your bird bath is the most important consideration to make. People often think that birds will enjoy the birdbath no matter where you put it, but it is not true. If placed in the wrong area, bird baths can actually do more harm than good. For example, if you place a bird bath under a tree or bush that regularly sheds its leaves, the bird bath will soon become filled with debris and can cause bacteria to grow, causing disease to the birds. A bird bath that is too far away from where birds are active will most likely never be used. And lastly, a bird bath that is placed near predators (such as your own cat or dog) will rarely be used because birds could get hurt or killed. Fortunately, there are many good places in your yard where a bird bath can be placed. The following are some tips that will help you decide where to put your bird bath. The size of your bird bath will depend on where you place it. A large bird bath will need to be placed on sturdy ground, such as concrete. Soft soil will not be able to hold the weight of a large bird bath. Also, if you buy a large bird bath, you should not put it near small plants because the bird bath may crush them. A small bird bath, on the other hand, can be placed nearly anywhere. Soft soil should be able to hold the weight of a small bird bath, and the bird bath cannot damage small plants. While a bird bath may look cute in the corner on your patio, if it is not visible to birds, the bird bath is useless. Make sure to place it in an area where birds can see it. This also means that if you have a garden bird bath, make sure your plants do not cover the bird bath. If plants begin to cover it, either trim the plants or move the bird bath to a different location. Sometimes we buy a bird bath to simply help out our feathered friends, but most of the time a bird bath is purchased so that bird watchers can easily watch birds. If this is the case, make sure you put the bird bath in a place that you can easily see. This could be by a window or out on your porch. You will constantly need to fill the bird bath, so it is a good idea to put the bird bath near a water source. This will save you from bringing water to the bird bath. If you have to place the bird bath far away from a water source, make sure a hose will be able to reach it. 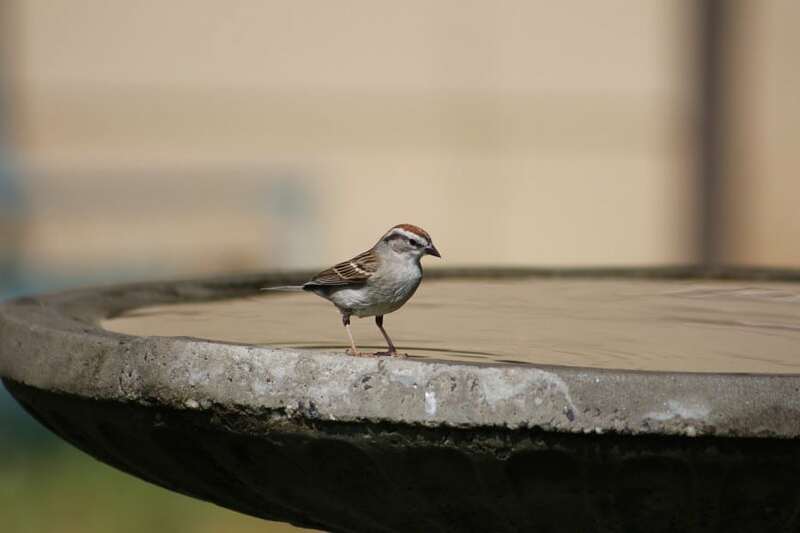 A fountain bird bath is an example of a bird bath that needs to be placed in an exact location near a water source. If the bird bath is too out in the open, birds may feel unsafe. Try placing your bird bath near a tree or bush where birds can quickly fly if they feel threatened. Make sure it is not too close to trees, because predators may hide in the trees. Again, trees and bushes can cause debris to fall into the water so place the bird bath several feet away from a tree or bush so that it is a safe environment for birds. If you have a solar bird bath, you will need to put it in a place that gets plenty of sun. It is recommended for the water to be around 0.5 to 1 inch at the edges, and sloping to a maximum of 2 inches deep in the middle of the bath. The edge of the bird bath should be much shallower than the middle of the bird bath. Consider what type of birds live in your area. Smaller birds will not use bird baths that are too deep. Therefore, if you have small birds where you live, try buying a smaller bird bath. A ground bird bath is probably as simple as a bird bath gets. It is basically a bird bath bowl that lays on the ground with no bird bath stand. A ground bird bath is a good, natural option for birds. Because most natural water sources are near the ground, birds will find a ground bird bath to be more like a natural habitat. Ground bird baths will also attract larger birds, such as ducks and quails. Pedestal bird baths are the most popular type of bird bath. 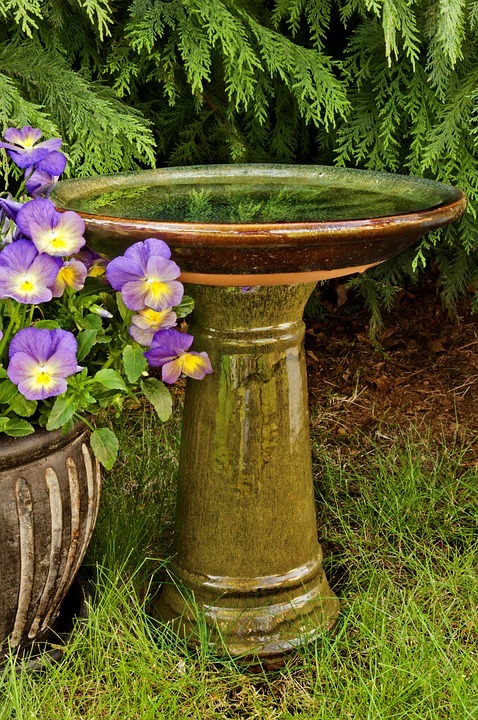 A pedestal bird bath is basically a bird bath bowl on a bird bath stand. A good place to get a pedestal bird bath is from Duncraft.com. Duncraft also sells other types of bird baths. Duncraft also sells hanging bird baths, fountain bird baths, ground bird baths, and other bird bath accessories. 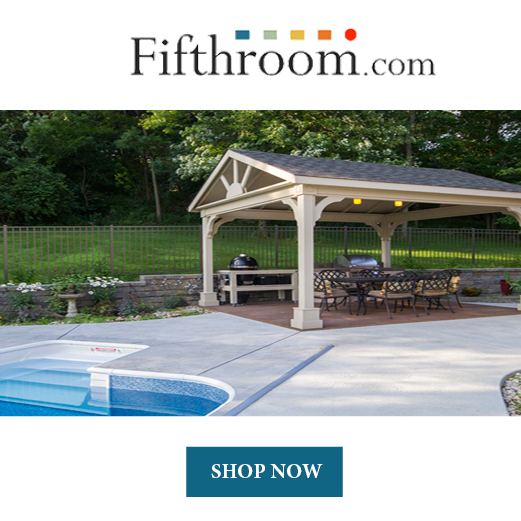 If you want to purchase a fairly inexpensive bird bath, a hanging bird bath is a good choice. A hanging bird bath is a bird bath bowl hung by chains. 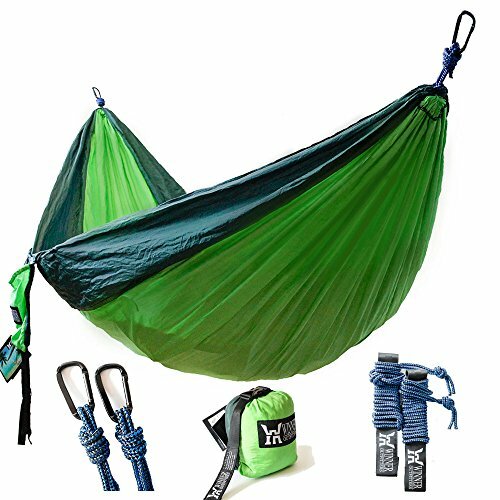 It is meant to be hung from a tree, garden hook, or gutter. A fountain bird bath is a good choice if you want a bird bath with movement. The fountain part of the bird bath is usually centered with still water around the edges. The fountain may either use a bubbler or a spray to form the movement. This type of bird bath is great for those who live in colder climates. It will keep the water from freezing, but not allow it to get too hot. This allows birds to still enjoy the bird bath even in the cold, winter months. Solar bird baths use solar energy to either heat the bird bath or create movement in the fountain. This type of bird bath is best for those who live in a sunny location. There are many unique bird baths available to buy. Among them are unique bird baths with creative designs, as well as those made from different types of materials. Before purchasing a bird bath, first, consider which style you would like. A metal bird bath is sturdier than other types of bird baths, such as glass bird baths. However, metal bird baths may not appeal to all people. 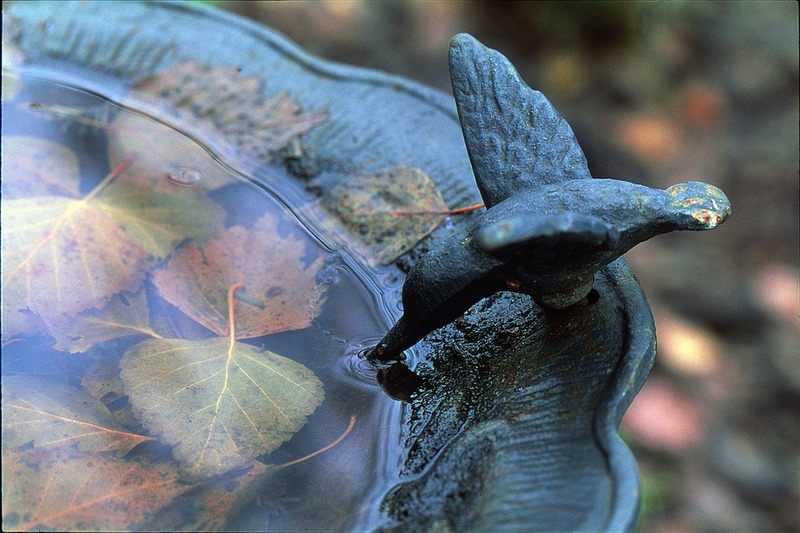 A glass bird bath is more fragile than other types of bird baths, such as metal or ceramic bird baths. Make sure you keep your glass bird bath in a safe location where it will not get broken. It is common for people to buy a ceramic bird bath. The most popular ceramic bird bath is a blue ceramic bird bath. Similar to the glass bird bath, this style is more fragile. There are so many different colors to choose from. The most popular color is a blue bird bath, or you can be unique and purchase one of many available colors. The decision is up to you. Bird baths come in many different designs. A mosaic bird bath, which is usually very colorful, features many different designs. 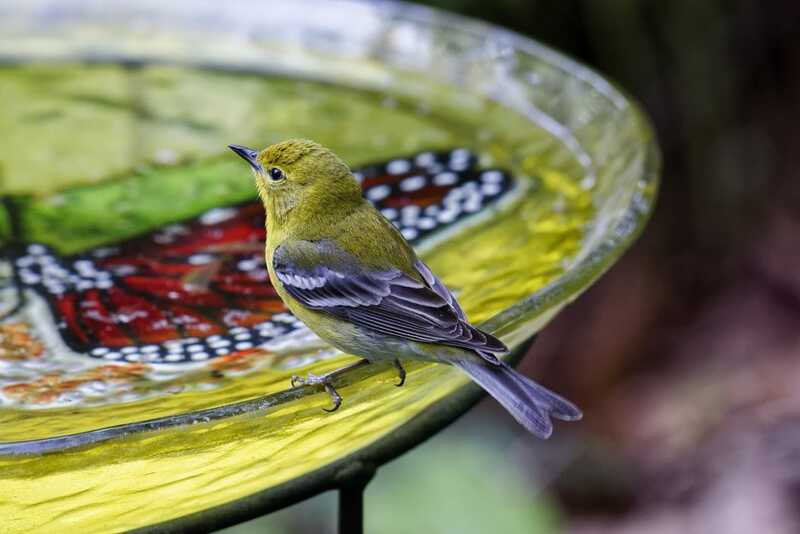 There are many mosaic bird baths available, and you may even be able to find some at local stores such as Walmart or Home Depot. Another common design is a bird bath with sculptures. Sculptures can include leaves, butterflies, small birds, fish, flowers, turtles, cats, and sometimes people. Remove dirt and debris from the bird bath often, including sticks or leaves. Before you refill the bird bath, dump out the old water first. Spray the bird bath with a hose once in a while. The pressure of the hose will help get rid of algae. Place the bird bath in a place where it will be free of debris. For example, do not put it under a tree or bush, or under a bird feeder. Go outside and simply check the bird bath. Make sure the water is filled and clean. 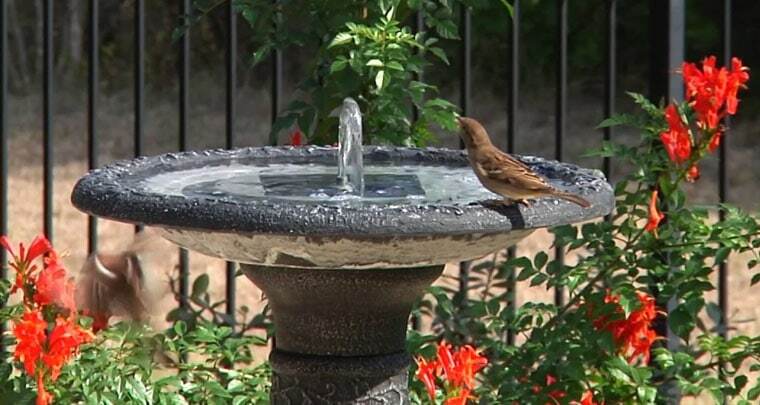 If you are using a solar bird bath or fountain bird bath, make sure everything is working properly. There are many ways to attract birds to your bird bath. Sometimes you may need to add a feature to your bird bath, such as motion, or other times it may be as simple as moving your bird bath to a new area. Below are some tips that will help attract birds to your yard and bird bath. While a tall bird bath stand may look pretty, most birds won't use it. If you think about it, natural water sources are near the ground which is what birds would naturally look for. Try buying a bird bath that is nearer to the ground. A clean bird bath will be more appealing to birds than a dirty one. Make sure to check your bird bath regularly to make sure it is free of dirt and debris. Sometimes birds need something else attractive to make them notice your bird bath. Try installing a birdhouse or a bird feeder in your yard. There are many creative DIY birdhouses that can be a fun activity for you or your children to make. 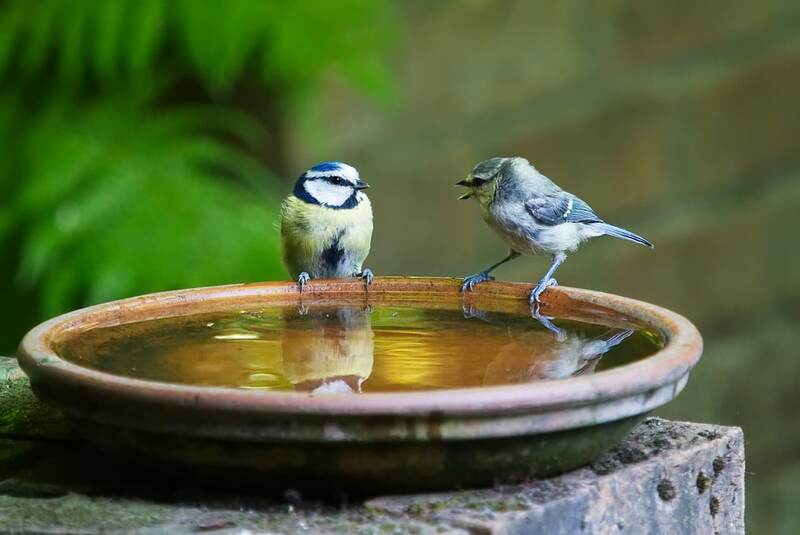 Birds are more likely to notice a bird bath if there is motion in the water. The motion will help reflect the sun, which will catch the birds’ attention, and they will see the movement. Natural water sources have movement, such as rivers and springs. Ponds have movement created from fish that are swimming in the water. So it may help to add motion to your bird bath too. If a week goes by with the bird bath being empty, most likely birds will leave your area in search of another water source. If you want to attract birds to your yard, keep the bird bath filled with fresh water. If none of these tips help attract birds to your bird bath, try moving the bird bath to a new location. Perhaps the bird bath was hidden under bushes and could not be seen. If so, move it out in the open. Or perhaps birds felt threatened, and need shelter near it. If so, move the bird bath a few feet away from a tree. Remember that once birds start visiting your bird bath, try not to move it again. Birds will get confused if the bird bath is in a new place and may not be able to find it. I have presented many ideas to consider when choosing and maintaining a bird bath in your backyard. 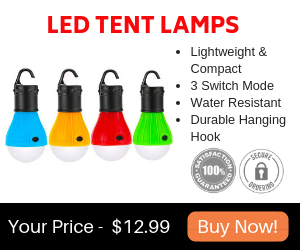 Pick out one that you like and that is appropriate for birds in your area. Then fill it up with fresh water and enjoy.